A2RC Program participants pause for a group photo with some of the A2RC counselors at a reception at the conclusion of the program, Friday, May 26 (front row, left - right) Dr. Alyssa Haithcox (PU DVM 2017); Shirissa Thompson; Ashlyn Carlton; Juliana Cuevas-Torres; Kayla Glenn; and Irenelys Colon-Manso; (back row, left - right) Floyd Williams; Bryce Bitsie; Labrawn Wade; Alaunie Smiley; Diamond Garrett; Teilor Ruff; Jorge Cotto Rosario; Daysia Reese; Monica Colon Hernandez; Leah Douglas; Gabriela Diaz-Rosario; and William Willis, of the DVM Class of 2020. 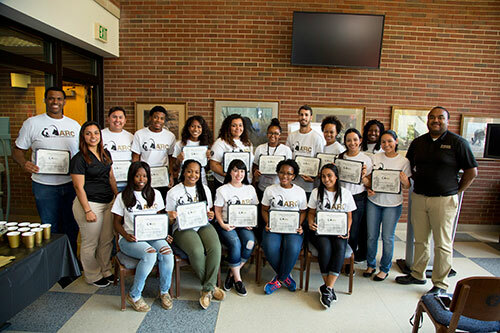 Sixteen students from all over the U.S. and Puerto Rico traveled to Purdue University last month to participate in Purdue Veterinary Medicine's 2017 Access to Animal-Related Careers (A2RC) Program. Coordinated by PVM's Office for Diversity and Inclusion, the annual two-week learning experience provides second- and third-year pre-veterinary students who are historically and currently underrepresented in veterinary medicine with a glimpse into the life of a first-year Purdue DVM student. 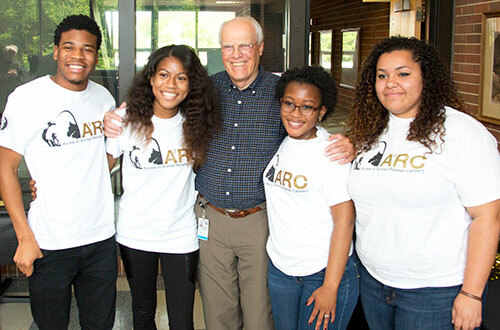 The 2017 class of A2RC scholars included students in agriculture, animal science, biology, food technology, microbiology, pre-veterinary, and zoology programs at Alcorn State University, Antillean Adventist University at Mayaguez, Michigan State University, New Mexico State University, North Carolina A&T State University, Prairie View A&M University, the University of Arkansas at Pine Bluff, and the University of Puerto Rico at Mayaguez. The A2RC program schedule was highly interactive and filled with sessions related to PVM's applications & integrations (A&I) courses and covering such areas as veterinary specialties, pre-clinical studies, food animal and companion animal, as well as providing trips to local cultural centers and excursions to the Eiteljorg Museum of American Indians and Western Art and an elk farm. New sessions for the 2017 program included "What's your communication style?" with Dr. Bianca Zenor, director of the Veterinary Technology Program and clinical associate professor; "One Health" with Dr. Audrey Ruple, assistant professor of one health epidemiology; and "Comparative Anatomy" with Dr. Kevin Hannon, associate professor of basic medical sciences. The A2RC Program concluded Friday, May 26, with a farewell reception in the Continuum Café hosted by the College in honor of the participants. Special thanks to faculty coordinators Drs. Michael Hill and Darryl Ragland, both in the Department of Veterinary Clinical Sciences, once again for their help in leading the program and to the A2RC program counselors for their assistance: Dr. Alyssa Haithcox (PU DVM 2017); Morgan Fortune, of the DVM Class of 2019; and Sofia Lopez-Valle and William Willis, both of the DVM Class of 2020. 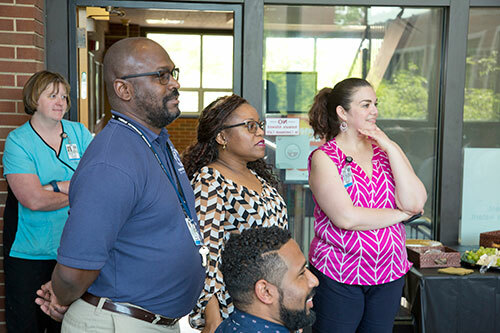 Dr. Darryl Ragland (2nd from left) watches as the A2RC students are honored at the Farewell Reception. He is joined by Dr. Kauline Cipriani, director of diversity and inclusion; Marisol Uribe, diversity and inclusion administrative assistant; (seated) Will Smith, II, director of international programs; and (back) Jennifer Ashley, RVT, senior instructional technologist in the Veterinary Teaching Hospital.